Escondido Police plan a Friday, March 11 DUI/Driver's License checkpoint...Again. When exactly one alleged DUI driver is stopped out of 1,393 vehicles at the last Escondido DUI/Driver’s License Checkpoint, but you have a $309,726 grant to set up DUI/Driver’s License Checkpoints, what do you do? Obviously, set up another DUI/Driver’s License Checkpoint. That’s going to be the case on Friday, March 11. The checkpoint will be set up at an undisclosed location within the city limits, probably from 6 p.m. to midnight. “The deterrent effect of DUI checkpoints is a proven resource in reducing the number of persons killed and injured in alcohol or drug involved crashes,” Escondido police Lt. Mike Kearney said in a news release issued today. “Research shows that crashes involving an impaired driver can be reduced by up to 20 percent when well-publicized DUI checkpoints and proactive DUI patrols are conducted routinely,” Kearney said. OK, what research? Nothing in the news release specifically cites any. The Feb. 12 checkpoint that netted one DUI arrest out of 1,393 vehicles was set up just outside the Escondido Police Department headquarters, south of El Norte Parkway at the southbound Centre City Parkway lanes by Decatur Way. Aside from the one is the loneliest number of alleged DUI suspects, the checkpoint resulted in six citations for suspended licenses, 16 citations for unlicensed drivers and six citations for driving without insurance, Kearney said. Based on that formula, the Escondido $309,726 grant from the California Office of Traffic Safety (OTS) awarded Nov. 9, 2015 for a year-long program of special enforcements and public awareness efforts to prevent traffic related deaths and injuries should result in “cost savings” of about $1.6 million. 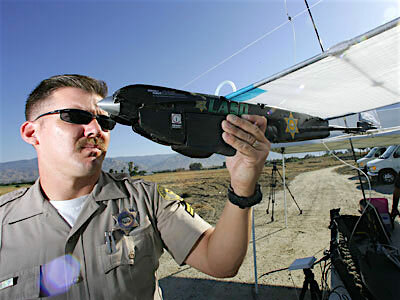 Los Angeles Sheriff’s Department sergeant checks out a drone. Sheriff’s Lt. Jason Vickery this week said the department was gathering information about using drone technology in its contract areas. “They would be used in emergencies and life-saving circumstances,” he said, referring to North County areas like San Marcos, Valley Center, Encinitas, Del Mar, Solana Beach and Rancho Santa Fe. Sheriff’s Department officials have been talking drones since 2012. Previous consideration came under fire from public interest groups for not being disclosed publicly. In fact, the MuckRock.com website fought a four month freedom of information law battle with department officials to disclose their drone plans. At that time, the Sheriff’s Department said “there is very little public benefit in the release of such records” pertaining to drones. Drone proposals would be examined by Sheriff’s citizen advisory groups, Sheriff’s Department committees, substation captains and ultimately Sheriff Bill Gore, according to Vickery. Public meetings also may be held on the subject, he said. The Federal Aviation Administration would have to sign off on any plans with drones costing between $2,000 to $85,000 each, Vickery said. 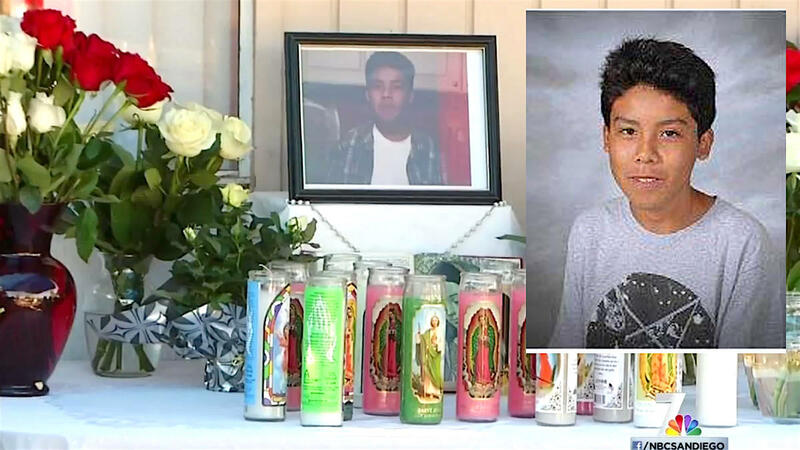 14-year-old Brandon Gonzales was shot to death in a quiet San Marcos neighborhood on Nov. 20, 2105. County homicides increased from 74 in 2014 to 83 in 2015. Most victims were males, 29 or younger, shot to death. African-Americans accounted for 22 percent of victims, though they make up only 5 percent of the county’s population. State figures reflected this trend. Of 1,746 California homicide victims, 549 were African-American, accounting for a homicide rate of 21.79 per 100,000 residents. The national African-American homicide rate was 16.91 per 100,000 residents, well above the the 4.27 overall national homicide rate. Most of last year’s local homicide cases, about 72 percent, were resolved, either by arrest, or the death of a suspect. Continuing a trend since 2013, fights led to the most slayings in San Diego County. Twenty-two of last year’s 83 homicides were believed to have occurred during a fight. Reasons for fights included fights between roommates and strangers, over slights and women. Ten victims were between 18 and 29 years old. Of San Diego’s murder-suicide cases, 75 percent involved a firearm, and men were implicated in all but one. Two involved elderly couples. At San Marcos, William Gery, 80 was seen trimming his hedges and checking his mail before going into his house and apparently shooting his ailing 84-year-old wife Inge in a murder-suicide on June 1. Gery called deputies before shooting himself. A note that was left suggested the deaths had been planned for some time. Be the first to comment on "Puhleeze: DUI/Driver’s License Checkpoint, Sheriff’s drones, county homicide rate"